This design has a true story since it was inspired by my first journey to Canada in August 2005. My husband had worked as a medical doctor in Canada at the beginning of his career and wanted to see again this wonderful Country and to take us to Montreal and Quebec. We visited The Stewart Museum at the Fort on the Île Sainte-Hélène of Montreal, the wonderful Cathedral of Montreal, and other interesting places of the town. Then we took a tour to Chute Montmorency, a waterfall of 272 ft., higher than Niagara Falls, until we reached Quebec City, following the St. Lawrence River. During this wonderful journey I started to think that my necessaire would have been a remembrance of those days like the motto of Quebec “Je me souviens” which means, “I remember”. My design tells the story of the journey of a Canadian sailorman, with his ship, leaving his home and family and then coming back. 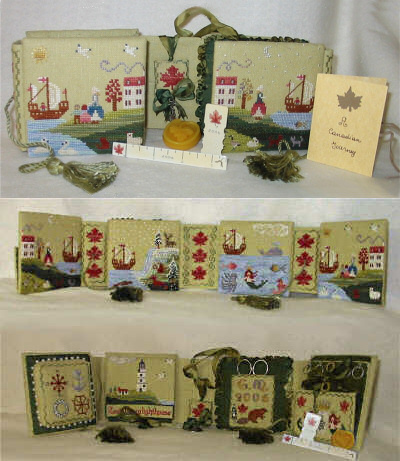 The necessaire, like a book, wants to remember those men and women who, on ships of the sixteenth and seventeenth century, left Bristol, St. Malo and many other ports, crossed the sea, and sailed up the St. Lawrence River in the days of New France. Those men and women were shores explorers and missionaries, statesmen and soldiers, artisans and farmers, who with audaciuosness, sacrifice, hope, and romance built the Canadian Nation. This design is dedicated to my Canadian friends Janice, Shirley Mae and Mélanie. Finishing instructions for the assembly of this necessaire can be found in the “Designing Ladies 2006 Finishing Instruction Book” by Just A Thought of Judy Odell. Judy is a professional finisher and would be happy to finish your stitching into a beautiful book like the one pictured on the chart. If you have any questions regarding the finishing of your necessaire you can e-mail her at judyodell@justathought.net and she will be happy to help you in any way she can. Fabric Pear 32 ct linen from Lakeside Linens 36 inches wide by 18 inches high. Threads The Thread Gatherer Silk'n Colors silk thread: 055 Camouflage Green, 087 Midnight Cobalt, 161 Bear Brown, 167 Prairie Winter, 181 Golden Pines, 185 Alpine Grasses, 971 Lavender Honey, 993 Irish Blues, 999 Wood Smoke, 1000 Wart Frog, 1012 Cinnamon Stick, 1015 Cameo Creme, 1024 Madeline's Locks - The Caron Collection Waterlilies silk thread: 197 Monsoon, 217 Chili - DMC Metallic thread: 5283. Stitches Cross Stitch over two and over one, Back Stitch, Chain Stitch, Eyelet Stitch.